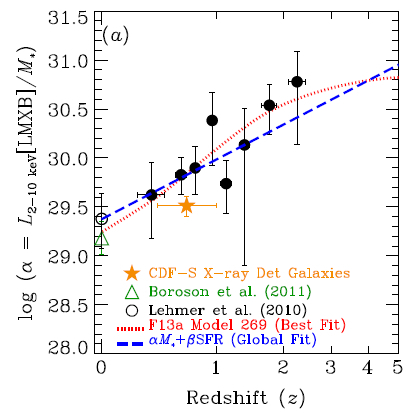 X-ray Luminosity per unit co-moving volume as a function of redshift (Fragos et al. 2013). X-ray photons, because of their long mean-free paths, can easily escape the galactic environments where they are produced, and interact at long distances with the intergalactic medium, potentially having a significant contribution to the heating and reionization of the early Universe. The two most important sources of X-ray photons in the Universe are active galactic nuclei (AGN) and X-ray binaries (XRBs). 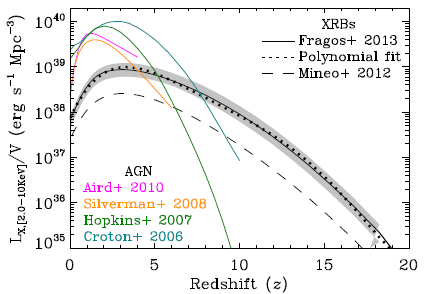 The X-ray emission from XRBs dominates over AGN at z ≳ 6 - 8. The shape of the spectral energy distribution of the emission from XRBs shows little change with redshift in constrast to its normalization which evolves by ∽ 4 orders of magnitude, primarly due to the evolution of the cosmic starformation rate. The amount of LMXB emission per stellar mass over cosmic time (Lehmer et al. 2016). It is the photons at energy below 2 keV that are most important to early heating and possibly to the reionization of the IGM. What we observe directly for z ≳ 4 galaxies is the rest frame ∽ 3 - 30 keV emission; therefore, the 0.5 - 30 keV spectral energy distribution, measured for local galaxies with Chandra and NuSTAR is a critical input to measuring the X-ray output of high-z galaxies at lower energy.